At the beginning of the year, the Grade 7 pupils are invited to become Monitors. We encourage the pupils to be Monitors as it instills a sense of responsibility and accountability within them. Both good traits to take them forward into adulthood. Over 70 pupils are involved in serving the school. They can help in the computer, music and art rooms, the library, preparing refreshments for sport, supervising the young children at the Little Oaks Pre-Primary School, assisting the Foundation Phase teachers, helping with the sound at Assembly and answering the phone at the front office during break. At the end of their Grade 6 year, pupils from the various houses (namely Red, Green, Blue and Yellow), who would like to be elected as a House Captain, are introduced to the members of their houses. The candidates, themselves, make an introduction and present a war cry. The children from Grade 4 to Grade 7 vote for the boy and girl whom they think would be a good House Captain. The boy and girl who attain the most votes will become the House Captains and the runners up will become the Vice House Captains. The House Captains from each of the houses receive their coloured sashes and badges at Prize Giving. 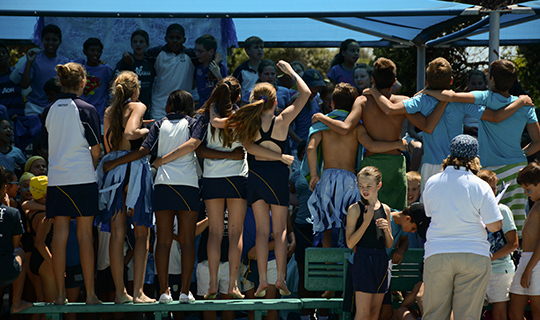 These leaders encourage their members to show spirit during the Inter-house swimming galas, at the athletics meetings and at the annual General Knowledge competitions. Every second week, the house with the highest number of points accrued by the pupils in their various classes, is announced at assembly. Again, having this status encourages the pupils to pursue leadership roles and teaches them how to be good role models.